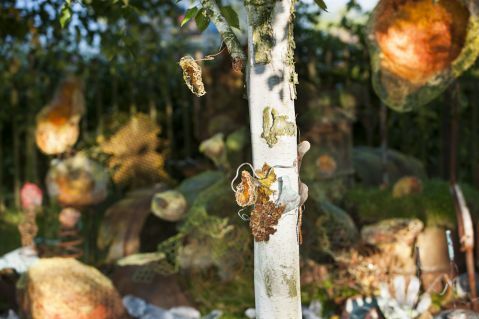 Fiona Campbell’s large scale site-specific installations for her allocated garden ‘Esotera’ are based upon the idea of Genesis’ Garden of Eden, related to the ethos and textures within the garden, created mainly from reclaimed materials. As part of Somerset Art Weeks Festival 2013, Fiona Campbell is one of 8 artists who have been commissioned to create a series of new contemporary site-specific art works for the Abundance Garden Trail, set in a wealth of cultivated garden landscapes in Somerset, using different materials and approaches in response to the theme of ‘Abundance’ in a wider context. The selected artists are encouraged to use locally sourced materials in response to the landscape, culture and knowledge from each of their allocated gardens. The Abundance Garden Trail is part of a new curatorial programme for Somerset Art Weeks Festival 2013, featuring a programme of exhibitions, new commissions and events. The programme is organised by Somerset Art Works, in partnership with National Garden Scheme.